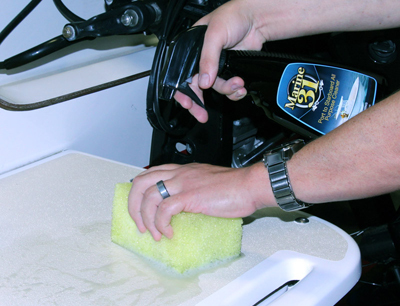 Your boat’s non-skid has never been this clean! The Marine 31 Non-Skid Cleaning Combo includes the safe and powerful Marine 31 Port to Starboard All Purpose Cleaner and the versatile, clean-everything Marine 31 All In One Non-Skid Sponge. This combination of cleaner and sponge will make heavy rubbing and scrubbing a thing of the past! Use the Marine 31 Non-Skid Cleaning Combo on virtually all hard marine surfaces that are in dire need of being cleaned. Marine 31 Port to Starboard All Purpose Cleaner is a biodegradable marine cleaner that encapsulates dirt and grime, leaving marine surfaces clean and fresh. Safe for virtually any surface, Marine 31 Port to Starboard All Purpose Cleaner can be used to remove black streaks, mildew, and other common stains that are found in the marine environment. Concentrated formula dilutes according to specific jobs – vinyl, carpet, upholstery, non-skid, and more! The Marine 31 All In One Non-Skid works great for removing mold and mildew stains from durable vinyl, and it can be even be used to scrub stubborn scum line stains. To really get the surface clean, combine the Marine 31 All In One Non-Skid Sponge with my Port to Starboard All Purpose Cleaner. A total retail value of $27.98. You save $2.98! Marine 31 Port to Starboard All Purpose Cleaner 128 oz.